The Stagecoach Country Music Festival returns for the 6th year with the addition of a third day of music. The festival proudly welcomes Brad Paisley, Jason Aldean, Miranda Lambert and Blake Shelton. Stagecoach 2012 also features Alabama, Martina McBride, Kenny Rogers, Luke Bryan, Sara Evans, Chris Isaak, The Band Perry, Justin Moore, Eli Young Band, The Mavericks reunion and more. Bluegrass music's J.D. Crowe, Del McCoury, Ralph Stanley and Greensky Bluegrass will add even more variety to the shows. Tickets go on sale Friday, October 28, 2011 at 10:00 AM PDT at Stagecoachfestival.com. Three-day weekend passes start at $149 for a limited time and layaway options are available. The festival also offers reserved seating, camping and RV packages. For a complete breakdown of available ticketing and onsite camping/RV options, please visit www.StagecoachFestival.com. Children 10 and under will be admitted for free. The Stagecoach Country Music Festival 2012 line up is as follows (as of 10/20/2011): Brad Paisley, Jason Aldean, Miranda Lambert, Blake Shelton, Alabama, Martina McBride, Kenny Rogers, Luke Bryan, The Mavericks, Sara Evans, The Band Perry, Steve Martin and The Steep Canyon Rangers, Chris Isaak, Justin Moore, The Jayhawks, Eli Young Band, The JaneDear Girls, The Del McCoury Band, Brett Eldredge, Aaron Lewis, Ralph Stanley & His Clinch Mountain Boys, Uncle Monk, JD Crowe & The New South, Sara Watkins, Sunny Sweeney, Dave Alvin and the Guilty Ones, The Unforgiven, Greensky Bluegrass, Split Lip Rayfield, Elizabeth Cook, JD Souther, Old Man Markley. 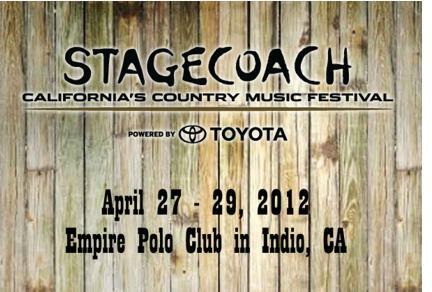 The Stagecoach Country Music Festival Powered by Toyota takes place at the Empire Polo Club in Indio, California on Friday, April 27th, Saturday, April 28th and Sunday, April 29th. Stagecoach is produced by Goldenvoice and The Messina Group.